With a classic sense of style, the Hanging Sphere planter features a contemporary craft look for a delightful play of light and a natural splash of fun. You'll love the eye-catching wicker-style design of these attractive planters, and you'll appreciate their exceptional resilience and durability. Unlike real wicker, these pots are made out of polypropylene resin that's designed to look almost exactly the same. It even has the same texture, so anyone who sees them is likely to believe they're actually made out of rattan. The resin ensures that they won't peel, fade, stain, unravel, dent or rust. Feel free to keep them out in the blazing sun or otherwise exposed to the elements. They will keep looking terrific the whole while. The liner and inner basket are easy to lift which makes planting a breeze. The large capacity ensures you have enough space to create the perfect flower arrangement every time. Attractive woven look and texture that's remarkably similar to real rattan & the rounded design makes them an attractive addition to any part of the home - indoors or outdoors. The sealed inner bowl and drainage plug allow for switching between indoor or outdoor use. The planter includes a decorative, rust-resistant triple-chain hanger for easy hanging, offering up to 15kg loading capacity. 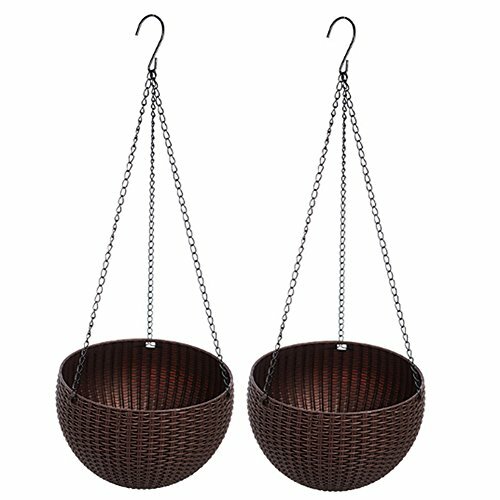 This hanging basket makes a great stylish addition to any part of your home or patio. The attractive decorative woven wicker has texture that's remarkably similar to real rattan, while this plastic basket is super low maintenance, mold-free, leak-free and easy to clean. Use multiple different colors baskets and plants hung at different levels to create your own unique decorative effect. Comes with great price and costumer service! 100% REPLACEMENT GUARANTEE.To make you have a better experience, please contact us if you have any questions, we will be glad to serve you! If you have any questions about this product by QEESTARS, contact us by completing and submitting the form below. If you are looking for a specif part number, please include it with your message. Macrame Handmade Plant Hanger Home Decorative Art, 9" x 28"